In just 10 years we’ve moved from laggards pondering whether they even wanted a website, to a circumstance where “content marketing” and “corporate storytelling” are garnering serious budgetary resources. But have we let the pendulum swing too far? Is it always a net positive to create and give away content on behalf of your company? Those were the questions examined by Joe Pulizzi and me a few weeks ago at Blogworld in Los Angeles. We also created and gave away for free a Content Marketing Testing Guide. 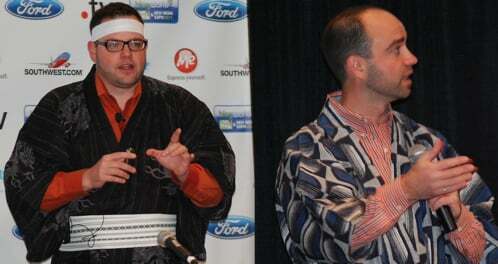 Our presentation was titled “How Much Do You Open the Kimono: Does “Thought Leadership” Cannibalize Your Ability to Monetize What You Know?” And indeed, we wore authentic (imported from Japan) kimonos throughout the session. Thankfully, the room was devoid of glass staircases and stiff breezes. To study the relative merits of content creation and dissemination, we declared there to be 6 stages on the content marketing continuum (6 stages of opening the kimono in the parlance of the presentation). The first stage in kimono-opening is to not open it at all. In this scenario, the business does not focus upon online thought leadership, concentrating efforts on other approaches. The example we studied is Marketface, a respected customer experience consultancy that works with major corporations on user experience and related issues. Marketface doesn’t blog, create white papers, produce podcasts, or anything we would consider to be modern content marketing. They are working on a book, however, which they believe to be a better vehicle to reach their CXO target audience. The second stage in kimono-opening is creating thought leadership by participating in communities and content opportunities that you do not control. Our example is Lisa Loeffler, founder of Genuine Media Co. Lisa is a experienced social media consultant. She believes that thought leadership is best perpetuated by developing 1:1 relationships via online communities. Thus, unlike the gaggle of consultant/speaker/author types in the social media game, she doesn’t do much blogging. Instead, she spends considerable time on sites like Linkedin, Twitter, and Empire Avenue, building bridges and making contacts. In fact, her new start-up company The PollTaker was co-founded with a business partner she virtually met on Empire Avenue. The third stage in kimono-opening is producing your own content, but doing so for a fee. Bob Bly is one of America’s leading direct marketers and informational product gurus. Bob is our example for Quid Pro Quo. He has a free email newsletter and a series of free tools like ROI calculators that he uses to build his distribution list (subscribers number well into the six figures). He then markets paid products to that list, creating a robust passive income stream. The fourth stage in kimono-opening is a familiar one to many B2B marketers: producing content and putting it behind a lead form. Lead-gated content envelopes us in a PDF-laden embrace seemingly everywhere. Clearly, this approach can generate a significant river of inbound leads for the sales team, as is the case at ExactTarget (client), our example for this stage. A leader in integrated interactive marketing including email, mobile, and social, ExactTarget has a decentralized approach to content creation. Different divisions and departments of the company create content for their own purposes. Perhaps their most popular recent content endeavor is the Subscribers, Fans, and Followers research series, which studies consumer psychology within social media and email marketing. These reports have generated many thousands of leads for the company. The fifth stage in kimono-opening is when companies produce significant, freely distributed content but do not reveal their operational “secret sauce.” This is the playbook of Openview Venture Partners, a venture capital firm based in Boston that surely creates more content than any other VC firm in recent history. Their successful blog and labs sites are updated daily, providing extensive resources for entrepreneurs and early stage companies. They even have their own in-house audio and video studios. It’s a LOT of content. Yet, Openview doesn’t divulge their specific investment criteria or valuation matrices, etc. The sixth stage in kimono-opening is unfettered, unrestricted content creation and delivery. Lead automation software company Eloqua epitomizes The Full Monty. Not only do they have staff dedicated to content creation (including corporate journalist Jesse Noyes), they adhere to four other philosophies that define this approach. First, they spread their content as widely as possible. In Trust Agents, Chris Brogan and Julien Smith called this “Giving Your Ideas Handles” and Eloqua certainly does it. Their content isn’t located solely on their own websites and blogs – which is all too common. Instead, they aggressively seek out other distribution platforms, and their use of Slideshare is exceptional. Second, they do not lead gate any of the content that resides off of their own site. Third, they create content for the (estimated by Eloqua) 85% of the market that doesn’t know who they are, instead of the 15% that do. This is a key finding, as most content is targeted to mid and late funnel thinking and objection overcoming, rather than top of the funnel awareness building. To that end, Eloqua often invests in content that’s not particularly related to their actual business. For example, their very popular Blog Tree infographics have created substantial awareness for the firm, even though their tie to social media and blogging is tangential at best. Fourth, they use content to maintain relationships with current customers, giving them “sneak peeks” of new materials before they are publicized and promoted. Smart. How Naked is Too Naked? Which of these kimono-opening stages is ideal for your business? I don’t know. There is no right answer, just the answer that’s right in your circumstance. The best way to identify it is to test, test, test. 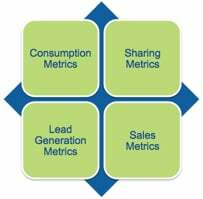 Establish a dashboard using the 4 Types of Content Metrics to measure the effectiveness of your efforts, and then create related pieces of content, treating each with different types of kimono-opening. For example, create 2 related ebooks and give one away for free, and lead gate the other. Convince & Convert and Content Marketing Institute co-created a Content Marketing Testing Plan that you can download for free to help you with this endeavor. More detail in the slides below. Which stage are you most comfortable with today?